Just dropping you a line to say thanks for a great job. We really noticed the difference! Looking forward to the water reaching the downpipes in the next storm - instead of splattering down the brickwork! We need the gutter clearance on a regular basis - I will be in touch again. What a refreshing change to find a team that takes such pride in their work. I recently had my six year old conservatory cleaned and it now looks like new. I also had my greenhouse cleaned ( a job I was dreading doing myself ), together with my house windows and guttering and am absolutely delighted with the outcome. Communication is excellent and prices are very reasonable. 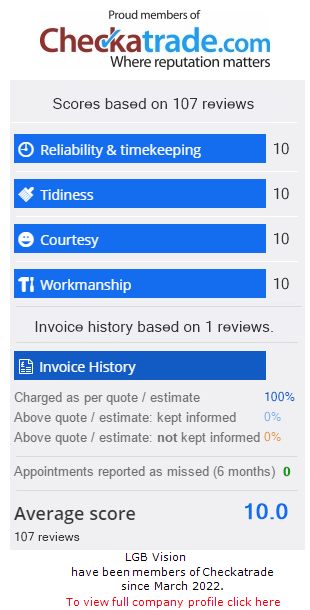 I would therefore recommend this company without hesitation, and look forward to employing their services for many years to come. Been looking for a window cleaner for ages. I moved onto a new development in Kempston and struggled to find a window cleaner who could reach our skylights. I contacted Lgb Vision as they claimed to be able to clean up to 60 odd ft! After a few emails they turned up and cleaned my windows to a very high standard. I am having them cleaned every 5/6 weeks which is much better than every 4 weeks! A first time very satisfied customer of Lgb Vision. Excellent job of cleaning all fascia. Soffits, gutters and windows to bungalow, garage & conservatory conservatory roof. Very professional & friendly - first class - thank you Damien. Used Lgb for my fascia cleaning. Results spot on and price to boot. Will tell everyone. Thanks Lgb.